Giving a human voice to “Erica,” Bank of America’s groundbreaking financial chatbot. 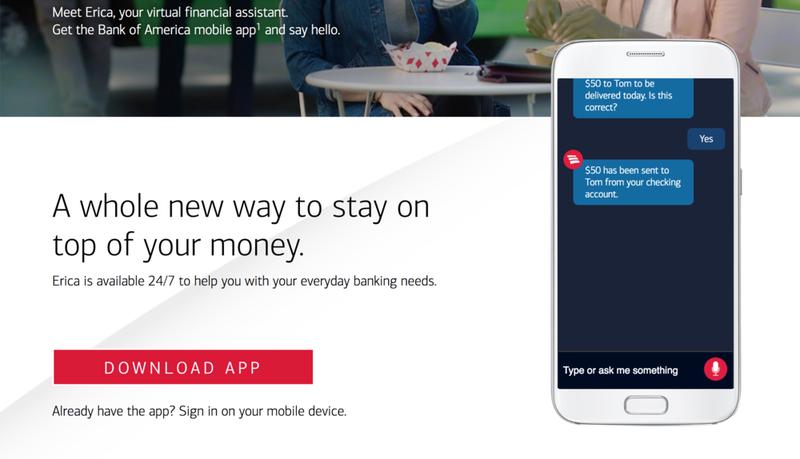 “Erica” is Bank of America’s is AI-driven virtual financial assistant, combining the latest technology in artificial intelligence, predictive analytics, and natural language processing to the company’s 25 million mobile clients. I worked closely with UX designers, product owners, and backend developers in determining the complex branching logic to display different messages for every use case. Adding to the complexity was the backend capabilities, which varied according to the type of account; thus, we had to find creative solutions in combining and prioritizing messages, and dealing with edge cases. Another challenge was to make technical financial terms more user-friendly, especially when it came to delivering “bad” news—such as when an overdraft occurs, or when there was a drop in a user’s credit score. The overall goal was to be clear while also having a “human-like” voice to be more appealing to users. We also had to work closely with business stakeholders and the legal teams to ensure that the dialogue and text met strict regulatory standards. I worked closely with the UX designers and the UX research team to ask questions and interpret user feedback on Erica’s dialogues, as well as the overall user flow to ensure accessibility and comprehension of the messages and financial insights. Additionally, I wrote user interface copy to help instruct users and provide clarity for touch interactions. Erica not only transfers funds and tells users their account balances, but is also able to offer specific and detailed financial insights to users based on their background information and account activities. This included helping users with their budgeting and spending, letting them know about upcoming recurring charges and Bank of America bills, monitoring their credit scores, and more.